2010 August 04 « It's For My RP Spec! Sometimes you acquire things, both in game and out, that you cannot bring yourself to get rid of. From movie ticket stubs to wristbands from concerts and raves, old tee shirts and various scraps of notes people have written me over the years, I have an awful time ditching things that are not useful in the slightest but hold some sort of sentimental value. This obsession carries over into WoW. A recent reorganization of my bank (due to the acquisition of Portable Holes in all my bagslots, thanks Yukora! ), I began to realize that I not only have a lot of junk that I can’t wear, but I have a lot of junk people never even SEE. Naturally, I have interactive accessories that I can lay out for all the world to see. 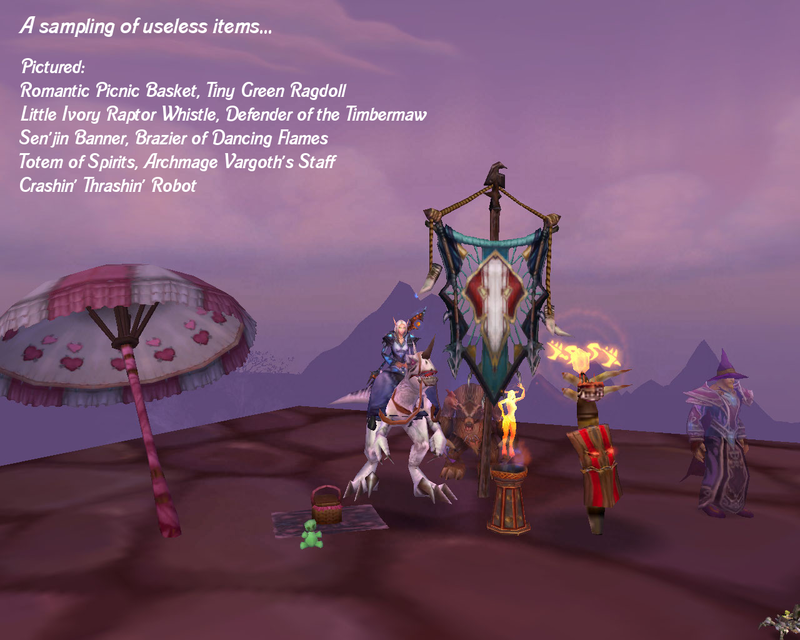 This list includes the Brazier of Dancing Flames, Sen’jin Banner, Romantic Picnic Basket, Totem of Spirits, and my beloved Archmage Vargoth’s Staff. I have the Piccolo of the Flaming Fire, Tiny Voodoo Mask, Winterveil Disguise Kit, Iron Boot Flask, and a Time-Lost Figurine. A Monster Slayer’s Kit, Argent Warhorn, Commander’s Badge, a Brightbew Charm, Defender of the Timbermaw, and an Argent Tome. I still have my Blessed Medallion of Karabor and Signet Ring of the Bronze Dragonflight. There are quest items I will never need again, such as the Unfinished Headpiece and Spectral Essence. Hell, I even have Party G.R.E.N.A.D.E.s, Path of Cenarius, Little Ivory Raptor Whistle, and a Haunted Memento. But what about the things that you hold onto that have no “on use” effect? No way to display them to the masses other than a link in /s and a fond story to tell? Some of those items are my most interesting items in my collection. First and foremost, something I will never get rid of: nine Splinter of Atiesh. During the Burning Crusade expansion, I was part of a group that ran Vanilla raids for fun. I picked up many random bits of gear, including my Necro-Knight’s Garb, and a Hand of Power. Some of them were recreated in WotLK Naxx (like the Hand of Power) and some were not (Necro-Knight’s Garb). But of all the things I picked up that are completely irreplaceable, my nine sparkling Splinters are my most treasured piece of ‘useless’ junk. Second on the list: Scepter of the Shifting Sands. This white-quality item sits in my bank as a reminder of the grueling 3+ years of scrounging raid groups, deputizing friends, and collecting random crap in the name of Narain Soothfancy. I have a small collection of books that I store in my bank as well. The War of the Shifting Sands, The Schools of Arcane Magic: Mastery, Brazier of Invocation: User’s Manual, Lament of the Highborne, and the Diary of Weavil. With the exception of Lament of the Highborne, these tomes are reminders of insane amounts of time and effort that I have put into this game. Sylvanas’s Music Box commemorates Suffocation’s Shadowmourne and also my guild’s acknowledgement that I am completely insane for scraps of lore that I can keep in my bags. Sataynia was cleaning out his bank the other day and had a few items he could stand to get rid of. It made me wonder: for those that aren’t obsessive collectors like us, what exactly do other people keep around? Any useless trinkets, silly ‘on use’ items, or just things that remind them of important times in the game?